Lafayette Parish has had four official Flood Insurance Rate Maps (called FIRMs). The historic maps are dated 1980, 1985, and 1988 with the most recent effective maps which originated in January 19, 1996 with one small area changed in January 1999. These are the maps that will continue to be in effect until December 20, 2018. The most recent FIRM updated by FEMA for Lafayette Parish and considered pending will go into effect on December 21, 2018. These maps depict the potential for flooding and are the basis for establishing building requirements and flood insurance rates. After viewing the floods maps, check with your flood insurance agent to see if a community letter is required to update your policy. If a community letter is required, please send an email with the full property address to sweeks@lafayettela.gov. Community letters are $25 and must be picked up at 220 W. Willow Street, Building B, Lafayette, LA 70501. Due to increased volume of requests, please allow up to 72 hours for notification that the letter is available for pickup. Note that our office can only provide community letters for properties located in the City Limits of Lafayette and unincorporated Lafayette Parish. If your property is in an incorporated municipality, you will need to contact your municipality for assistance. 1. I heard that Lafayette Parish will soon have new flood maps. Is this true? YES. After a nearly 10 year mapping process, FEMA finalized the Flood maps for the parish and they will become effective for rating flood insurance on December 21, 2018. 2. Can I get an official letter from my community showing my flood zone and Base Flood Elevation (BFE)? YES. You can request a community letter by sending an email to sweeks@lafayettela.gov with the full property address and we will reply within 72 hours that the letter is available for pickup. There is a $25 fee for this service and the letter can be picked up at 220 W Willow St, Lafayette, LA 70501 with 72 hours advanced notice. 3. My flood zone has changed from Zone X to Zone A or AE. Will my rates increase immediately? NO. Your rates should not increase immediately. Because you’re newly mapped into the high risk area, talk to your agent about the Newly Mapped Procedure which allows you to maintain Preferred Risk Rates (if you have a favorable loss history) for one full year after the effective date of the new map. You will then see small incremental increases each year thereafter until you’ve reached your full-risk rate. Full-risk rates are based off of your Elevation Certificate. If you do not have an Elevation Certificate, your full-risk rate will be reached once your annual increases equals the Standard AE or X policy rates. Share this NEWLY MAPPED FACT SHEET with your agent. 4. How do I obtain an elevation certificate for my property? Elevation certificates can only be completed by a licensed land surveyor, engineer, or architect. Elevation certificates are necessary to determine what your flood insurance rate will be, when your home is in a flood hazard area that starts with the letter A. It shows the difference between your finished floor and the Base Flood Elevation (BFE) for your property. This difference ultimately determines what your flood insurance premium will be. The higher your home is above the Base Flood Elevation, the lower your flood insurance premium. If there is no Elevation Certificate on file for your property, you may want to reach out to a licensed surveyor, engineer or architect to request a new Elevation Certificate. There is a fee associated with getting a new certificate. If your home/business was built within the last 5-7 years, check this list to determine if there is already Elevation Certificate for your property.Elevation Certificates: Who Needs Them & Why? A. Do Elevation Certificates Expire? I see an expiration date on them? provide additional information, such as new photographs of your home or business. The expiration date on that form means that surveyors and engineers can no longer use that certificate to complete new elevation certificates. B. Are there cases where I would need a new elevation certificate? YES. If you make substantial changes to your building in a high-risk area—for example, you make an addition to your home or convert the garage to living space—you likely need a new EC to reflect the new building characteristics and Lowest Floor Elevation. 5. My zone has changed from A or AE to Zone X. What should I do? Should I get rid of my flood insurance? NO. This is great news! FEMA doesn't feel that your home is a high risk, but please keep in mind that anywhere it can rain, it can also flood and nearly 25% of all flood claims come from Zone X, so it is important to keep your flood policy, as it should be less than $500 per year (depending on your loss history). The risk is simply reduced, not removed. Talk to your agent about converting your policy to a low cost Preferred Risk Policy, if it qualifies. 6. What do I do if I feel the maps are wrong and I should not be in a newly mapped higher risk flood zone? Can I change my zone? It depends. There are scenarios where the boundaries of the flood zones do not accurately reflect the true topographic characteristics of a property (meaning, your home or property is on a piece of high ground). The flood study completed by FEMA, may not have been able to pick up that high piece of ground, so it was included in the flood zone. Knowing the process cannot always pick up every single piece of ground, FEMA created a process called a Letter of Map of Amendment, which overrides what is shown on the flood maps, because of the elevation of the property or structure. If approved, it could essentially change the flood zone designation for the property to a lower risk category. In order to qualify to remove a structure from the higher risk zone, the lowest adjacent grade of the structure would have to be AT or ABOVE the Base Flood Elevation for your location. 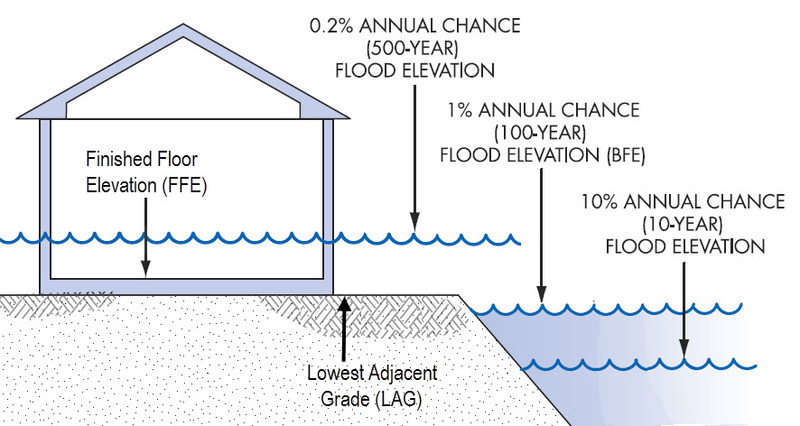 Every location has a different Base Flood Elevation and this is an estimate of what the floodwater is expected to rise to in the 1% Chance Flood (or the 100-Year Flood). This is the flood that has a 1% chance of happening in one single year (NOT THE FLOOD THAT HAPPENS EVERY 100 YEARS), and it also is what FEMA uses to determine what areas are in a higher risk flood zone. If your elevation falls below the Base Flood Elevation, then you are included in that flood zone. If it is above, you should not fall into that flood zone. Applying for a LOMA will require that a licensed surveyor or engineer complete an elevation certificate for your home. FEMA will not review a LOMA application without elevation data from a licensed surveyor or engineer. Once your elevation certificate is completed, follow these instructions and you may submit the certificate along with this application to FEMA for consideration for removal from the special flood hazard area. This process can also be completed online. For questions about flood insurance or the National Flood Insurance Program (NFIP), please contact the NFIP Help Center at 1-800-427-4661 or visit www.FloodSmart.gov. For a comprehensive list of FEMA contact information, including Disaster Assistance, please visit the FEMA Website. Zone A - Special Flood Hazard Area, within 100 yr floodplain, BFE not determined by FEMA. Zone AE - Special Flood Hazard Area, within 100 yr floodplain, Detailed study by FEMA, BFE determined by FEMA. Zone AH - Special Flood Hazard Area, within 100 yr floodplain, Areas of ponding, BFE determined by FEMA. Zone X500 - Areas not in a Special Flood Hazard Area, within The 500 yr floodplain. Zone X - Areas not in a Special Flood Hazard Area, outside The 500 yr floodplain. Floodway – In the floodway, communities must prohibit encroachments, including fill, new construction, substantial improvements, and other development within the adopted floodway unless it has been demonstrated through hydrologic and hydraulic analyses performed in accordance with standard engineering practice that the proposed encroachment would not result in ANY increase in flood levels within the community during the occurrence of the base flood discharge. Current and Preliminary Flood Zone Map PLEASE NOTE: This Preliminary Flood Zone Map is NOT the official map and is subject to change, the paper version is the official map. Residential Construction: New Construction or substantial improvement of any residential building (or manufactured home) shall; have the lowest floor, including basement mechanical and utility equipment, and ductwork, elevated no lower than 1 foot above Base Flood Elevation.